The sixth edition of the most attractive wine event in Southeast Europe – SuperWine will host selected European wineries in the luxury yacht marina of Porto Montenegro this year as well. Once again, SuperWine is bringing the most prestigious regional and European wineries together. 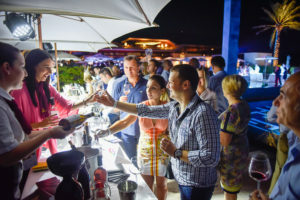 The carefully selected wineries coupled with the outstanding Porto Montenegro vibe, guests from around the world and fascinating side events will all help SuperWine 6.0 justify its reputation of ‘No. 1 wine spectacle’ in this part of Europe. With the exhibition of exclusive wineries, DJ sets, a fashion show and gastronomic zones with Mediterranean delicacies we have all the right reasons to expect the best SuperWine salon so far. SuperWine 6.0 is taking place on the 7th July on the Porto Montenegro Yachting Club pool, between 8 pm and 1am. Tickets for SuperWine 6.0 will be available on the day at the cost of EUR 30 per a single day ticket.